Diving Accidents can occur in even the most placid environments, and to the most experienced divers at almost any depth. If you or your buddy are affected by anything detailed below, call our Divers Emergency Service in the UK on 07 999 292 999 for free advice 24/7 all year round. 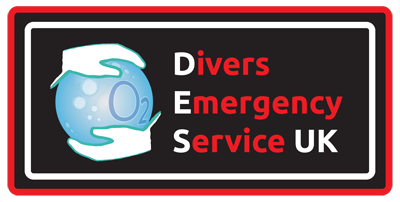 Call our Divers Emergency Service number in the UK on 07 999 292 999. We are available 24 hours a day, all year round. Get free advice and referrals for NHS-funded treatment. The direct cause of Decompression Sickness, or ‘the Bends’, is due to bubble formation and growth within body organs and tissues. Whilst mainly seen in divers it can also occur high altitude pilots or astronauts as well as persons working in compressed air environments. The exact mechanisms are not fully understood but rapid ascents from depth or sudden decompression as well as incorrect decompression procedures do seem to be a cause. Effects differ from person to person but varying predisposing factors are thought to heavily contribute to DCI even with correct procedures. Breath holding and air trapping in the lungs during ascent or decompression may also lead to DCI as well as some heart defects. As with all activities we undertake, professionally or in our free time, safety is a key factor and prevention will always be more desirable than reaction with regards to possible injury or illness. Often, being aware of what not to do can be as important as knowing the correct way to proceed. You will find a list of some factors that increase the chances of DCI on this page. Depending on how DCI has shown itself in a diver, there are different risks (some quite severe) to not getting prompt treatment. If joint pains remain untreated, there is a possibility that small areas of bone or cartilage may become damaged. This condition is called is called osteonecrosis and used to be common amongst commercial divers. When this occurs bones may become brittle possibly leading to arthritis. In cases of neurological DCI the spinal cord could remain permanently damaged, the symptoms of which may vary considerably between individuals. In cases such as these where a patient suffers from a subsequent episodes of decompression illness as a result of further diving activity the chances of a full recovery may be reduced considerably. In severe cases of Decompression illness where DCI is not treated the diver may sustain a permanent residual injury such as: muscular weakness, neurological damage and even sexual dysfunction. The following are examples of factors but is not meant as an exhaustive list. A frequent contributing factor for DCI, consumption the night prior to a dive causes a degree of dehydration which will increase the chance of DCI. Not always avoidable but check kit thoroughly before diving and ensure you know how to use any new kit and have checked it at shallow depth. At altitude there is a lower partial pressure of each gas. If nitrogen bubbles are present their volume will increase, worsening any symptoms of DCI. In view of this it is recommended that flying be avoided until 12-24 hours after a dive. There is some evidence to suggest that there is an increased chance of DCI for women mid-menstrual cycle. Men are more likely to have an episode of DCI than women due to risk taking behaviour. Most dive computers use theoretical data, often based on fit young men (e.g. Navy divers). Many recreational divers do not fall into this category! It is always safer to do slightly longer decompression than recommended by the computer/tables. Fat is five times more soluble to nitrogen than muscle, so there is an increased nitrogen load. Put simply, a patent foramen ovale (PFO) is a hole in the heart that should close after birth. 25% of the general population have a PFO but up to 75% of those with unexplained DCI have a PFO. A test involving an ultrasound scan of the heart (echocardiogram) and injecting a saline solution that has been vigorously mixed with blood can be performed in divers with unexplained DCI to determine whether they have a PFO. Following a dive the body will have a residual nitrogen load, this needs to be taken into account when planning the following dive(s). Causes blood vessels to vasoconstrict which will reduce tissue perfusion. Increases amount of CO (carbon monoxide) in the blood which reduces the bodies oxygen carrying capacity. Cold water increases the oxygen demand on the body. Gas Embolism is the presence of bubbles of air or any other gas in the circulation If your interest is in connection with a current patient, YOU HAVE TO ACT NOW! Call us on 07 999 292 999 straight away. Symptoms and signs of Gas Embolism vary widely and its consequences range from mild discomfort (seen as microbubbles in decompression illness) to causing rapid death. Can be caused by various invasive medical/surgical procedures but occasionally also seen as diving accidents. Upon entering the vascular system, gas bubbles follow the blood stream until they obstruct small vessels. Depending on the access route, a gas embolism may be classified as venous or arterial. Diagnosis is based on the sudden occurrence of neurological and/or cardio- respiratory manifestations.